Map It! Okinawa: "Gateway to the Other Side? Hamahiga Island"
"Gateway to the Other Side? Hamahiga Island"
Gateway to the 'Other Side'? A view of Hamahiga at low tide. 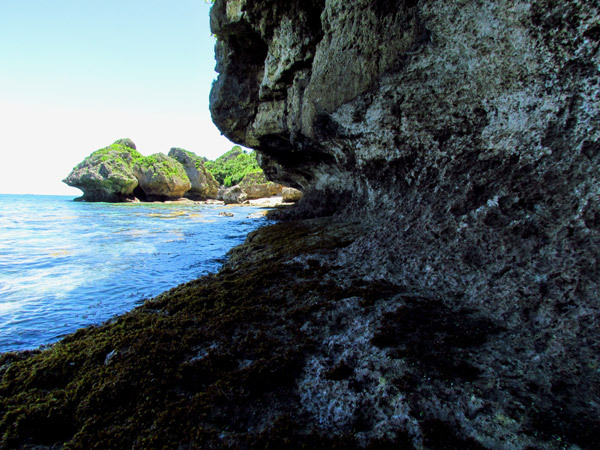 There are many, many beautiful places here on Okinawa, and Hamahiga Island ranks very high among them. But to understand the intrinsic beauty of Hamahiga, it's imperative to see it through its historical context. This is but a small prelude into the mysteries and legends of Hamahiga Island. 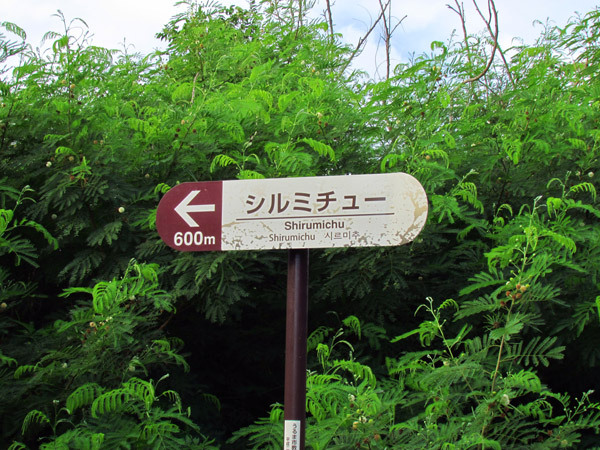 The Okinawans have a term that describes a world, far and beyond on the 'other side'. It is a world in which the gods and spirits live; a world connected and yet separated, only by the sea. In Okinawan dialect this is referred to as 'Nirai-kanai', and is steeped heavily in the Okinawan psyche...and on Hamahiga Island, this belief is very much alive, both in nature and in the people of Hamahiga. 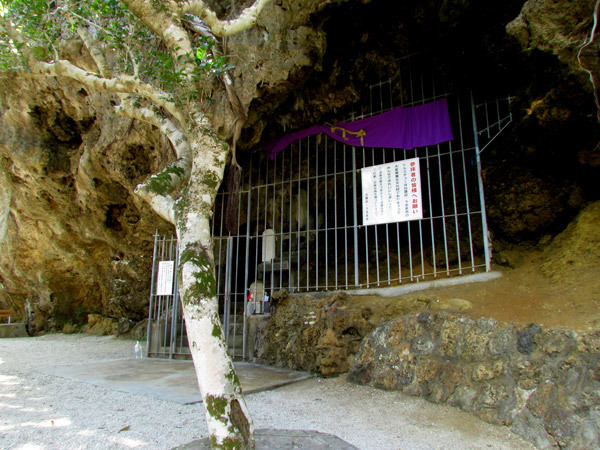 Along with Kudaka Jima, Hamahiga ranks as one of the most sacred islands in the Ryukyu Archipelago. It is believed that the first 'creators' of the Okinawan civilization, Amamichu and Shirumichu†, settled here many, many years ago*. In fact, the final resting place of Amamichu is believed to be in a small crypt just off the eastern shores of Hamahiga. And further south, lies the Shirumichu Shrine, a cave elevated on a rocky hill honoring these deities. There are other places on Hamahiga that are mysterious and steeped in local legend, some very recent and soon to be discussed. But as you walk around the natural landscape of Hamahiga, one cannot help to imagine if there is a connection with Hamahiga and the 'other side'. The 'Gateway'. The title is the just a metaphorical interpretation surrounding the breathtaking beauty and the 'laws of nature' at work throughout Hamahiga, juxtaposed with its history and the belief of 'Nirai-kanai' and animism. 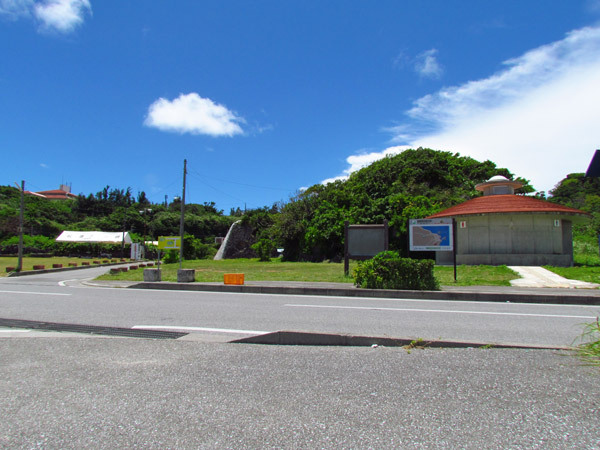 It is important to understand this link in order to understand how some Okinawans view and connect with the 'spiritual world'. Just as you arrive at the Shirumichu Shrine parking area (marked by the Green Thumbtack in the map), you will see a natural corridor in-between two large rocky mounds as seen in the above picture. A gateway perhaps? Having a grasp of Hamahiga's history, one can be inspired to imagine many things. Nevertheless, it leaves you to wonder; what lies beyond the 'other side'? At high tide, it's too difficult to venture safely on foot. But at low tide, your curiosity can be set free. As you move further through the corridor, you will see (to the right) a 'natural' sidewalk made of coral that can only be used safely during low tide. Don't expect to see a miraculous statue or pot of gold on the other end...just a sense of peace and satisfaction. If this is indeed a gateway, it does beg the question; does the doorway to 'Nirai-kanai' have a connection with the change of tides? Having observed some religious practices here on Okinawa, it wouldn't be all that surprising if some Okinawans share that view. Just make sure you return before the tide comes back... or you will be stuck on the other side. Author's note. The natural corridor or 'Gateway', described above, is just an impression inspired by local legends of Hamahiga and not based on any specific beliefs held by the local Okinawans (that I know of). 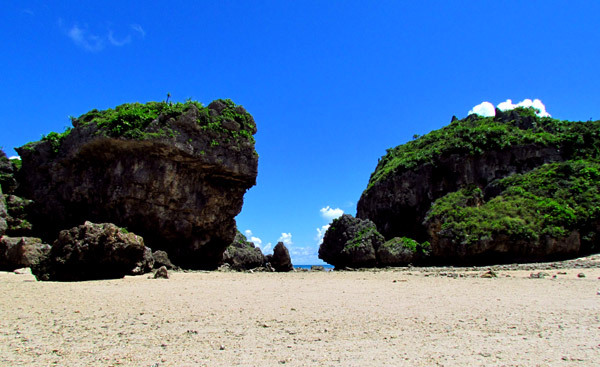 If you are in love with Okinawa's natural landscape, then the 'gateway' described above is a place you will want to venture out to at low tide. Map Information. The Amamichu Grave, Shirumichu Shrine, and the 'Gateway' all have a placemarks at their respective locations in the map above. The natural corridor or 'Gateway' is marked by the Green Route marker. The Pink Route marker marks the walking route for the Shirumichu Shrine. The GPS information above is to the parking lot also designated by the Green Thumbtack. Tide information. Low tide is the best time to venture out through the corridor safely (and to visit the Amamichu Grave site). The following link is tide information around Ikei Island which is the closest island to Hamahiga: http://magicseaweed.com/Ikei-Surf-Report/3392/. 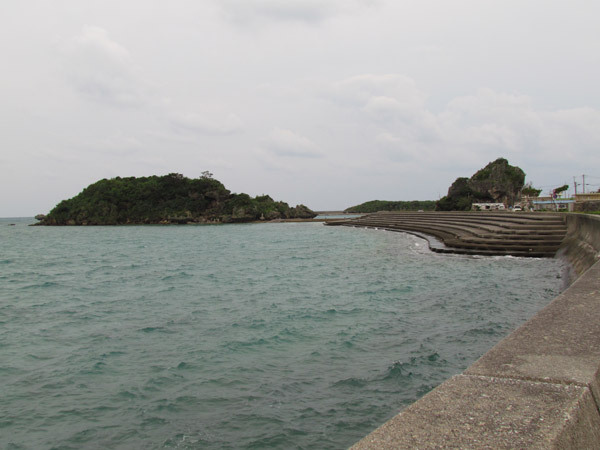 Other tide information will vary around Okinawa Prefecture. Directions. 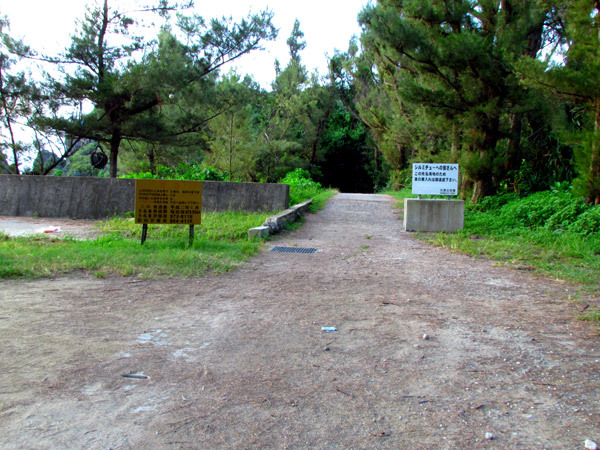 You can drive to Hamahiga from the Katsuren Peninsula via Highway 10. You will see signs directing you to Hamahiga Island. You will have to cross the another bridge to enter Hamahiga. Once you arrive on the island, you will turn left or veer east. The Amamichu Grave will just be off the road on a medium size coral mound next to the shore (see map for Pink Balloon icon). The most difficult place to find is the Shirumichu Shrine. Please use this LandMark as the turn-off point to the shrine also seen in the map above. This is where the designated Blue Route begins. The LandMark will be a small restroom facility. Along the way you will see these historical signs pointing you to the way. Once you arrive at the parking lot, it will not be immediate apparent that there is a shrine in the nearby area. You will see a path off to the woods straight ahead. See Pink Route in the above map. 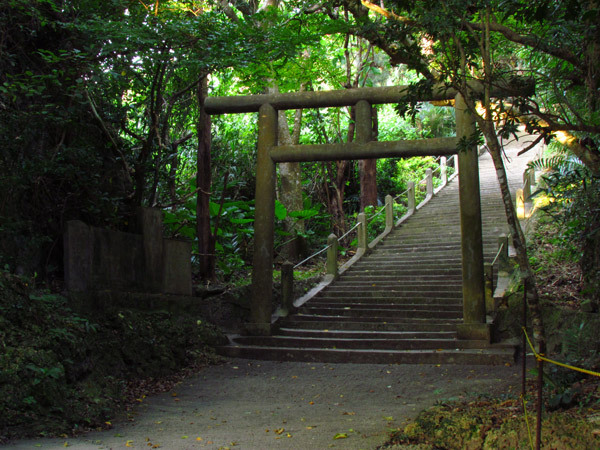 It will lead you to the first Torii Gate and then to a set of stairs. Source. Okinawa Diaspora (Okinawa's first creators), pg 145, Ronald Nakasone, University Hawaii Press 2002. 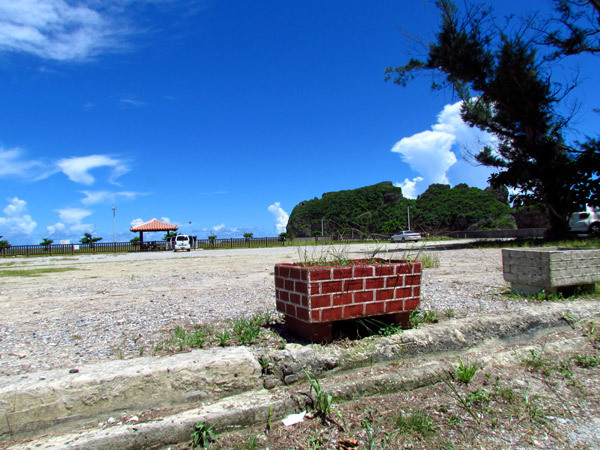 Grave of Amamichu, http://en.okinawa2go.jp/is/OCVB1EN0020120902/show. Definition, Nirai-kanai (also spelled nireekanee), Okinawan English Wordbook, Mitsuyu Sakihara, University Hawaii Press 2006. Related articles. Azama Port: Gateway to Kudaka Island. In the Beginning...there was Kudaka. Other places of interest nearby. 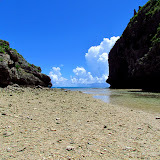 Off The Beaten Path - Hamahiga, The Agari no Utaki, Hamahiga Beach, Amamichu's Grave, Shirumichu. † Amamichu and Shirumichu are sometimes referred to as Amamikiyo and Shinerikiyo, respectively. *Okinawa legends may vary about the origins of the first Ryukyu gods. It is widely believed that Kudaka is where the gods first descended upon. When asked about the relationship between Hamahiga and Kudaka, a tour guide offered one interpretation. She said some believe the gods first descended to Kudaka and then later settled at Hamahiga. we stumbled upon this while out driving around, going back for sure!! It's definitely worth going back to Erin!